Legendary godfathers of riddim Sly Dunbar and Robbie Shakespeare, Chris Blackwell, founder of Island Records are re-teaming to helm production on a new recording by musician/poet/activist Michael Franti, who achieved renown with the groups Spearhead and the Disposable Heroes of HipHoprisy. Franti, joined by long-time Beastie Boys collaborator, and producer, Mario Caldato Jr are coming to Kingston to lay down tracks for the disc. The project marks the first time in 20 years that the dream team of riddim, beats and the iconic reggae impresario are working together in studio, the last time being on the groundbreaking albums of Grace Jones. The duo will perform and produce live drum and bass parts lending their distinct sound to the record. Kingston-based percussion players, Uzziah "Sticky" Thompson, drummer "Bongo" Herman, keyboardist Robert Lynn and Spearhead band members, Carl Young and Dave Shul are featured as well. Franti, who previously recorded for Blackwell on the Island label, said he and Blackwell agreed to record the album in Jamaica to tap into Kingston's raw heartbeat. Many of the songs for the still-untitled album were written shortly after Franti's journey into the war zones of Iraq, Palestine and Israel this past summer. This trip not only inspired the new work, but also Franti's directorial debut and first feature-length film titled, I Know I'm Not Alone, which closed the independent film festival, Slamdance, to a sold-out audience and rave reviews. The album is scheduled for a fall 2005 release via Blackwell's Palm Pictures label, with the film scheduled to be released alongside. "I believe that these progressive innovators can only take my music to the next level," Franti told the media in a previous interview. 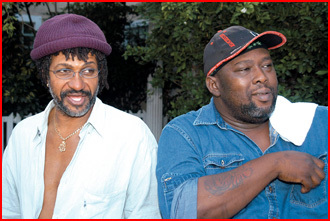 Sly and Robbie have produced and performed on countless records over the past 20 years from Peter Tosh to Grace Jones, Simply Red, Mick Jagger to No Doubt. Chris Blackwell, in addition to his association with Bob Marley and the Wailers, produced albums for Jimmy Cliff, Grace Jones, Joe Cocker and Steve Winwood. Blackwell's long affiliation with Marley proved him to be a primary force in introducing reggae into the global pop mainstream. Continuing his innovative instinct, Blackwell launched his Palm Pictures audio-visual label that broke ground by focusing on the DVD format - once again being ahead of the game. Filling out the team is Brazilian-born producer Mario Caldato, Jr, producer and mixer for such artistes as Bebel Gilberto, Beck, Tone Loc, but best known for his work on the Beastie Boys' Paul's Boutique, Check Your Head, I'll Communication and Hello Nasty. Mario C brings his history of hip hop and love of Jamaican music into the project, but most recently and what interested Franti was his nurturing, organic production of Jack Johnson's On and On and the newly-released In Between Dreams.